Thoseindustrious robots on Mars--NASA's Spirit and Opportunity rovers--remain on dutyas they gather new science data from their respective spots on the red planet. Opportunityhas just concluded a survey of Beagle Crater, a relatively young feature, saidWilliam Farrand, a research scientist at the Space Science Institute in Boulder, Colorado. He is also a member of the Mars Exploration Rover science team. Farrandtold SPACE.com that Beagle is named after the ship, H.M.S. Beagle, thatnaturalist Charles Darwin served on. Over the weekend, Opportunity'sPanoramic Camera was busy collecting a color sweep of Beagle Crater and itsblanket of tossed out material. "Sothat should make for a pretty spectacular data product when all the full framescenes are finally downlinked," Farrand said. In addition, Opportunity ground handlers snagged multispectral views of the scene. In addition, by using the robot's Miniature Thermal Emission Spectrometer (Mini-TES), data on themineralogy of rocks and soils at Beagle was obtained, he said. 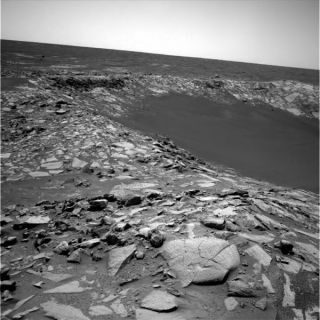 Opportunitywill next be examining a banded ripple and then resume its drive towards Victoria crater, Farrand said. The 115-foot (35-meter) Beagle Crater and the rover are bothabout 1,837 feet (560 meters) from the rim of Victoria. VictoriaCrater is nearly half a mile (800 meters) in diameter. That's nearly six timeswider than Endurance Crater, the feature that Opportunity explored for severalmonths in 2004 studying rock layers affected by ancient water. "Everybodyon the team is pretty excited about the prospect of getting to Victoria crater," Farrand added. When the robot pulls up to that feature, scientists are expecting to see something like 65 feet (20 meters) of stratigraphic sectionexposed on the walls within Victoria. "Thatwill give us a deeper view into the past history of Meridiani Planum than wegot at Endurance crater or any of the other craters examined to date on themission," Farrand explained. Whilethe slogging has been slow, Opportunity's arrival at Beagle Crater is good newsto Larry Crumpler, a member of the Mars rover science team. He is also researchcurator in volcanology and space sciences at the New Mexico Museum of NaturalHistory and Science in Albuquerque. Beagleappears to be a fairly well-preserved little impact crater, Crumpler said,"kind of a mini-Endurance." Crumplersaid that scientists may be having one of the last chances to view the uppermeter of the bedrock before the Mars rover gets into the dark apron materialaround Victoria. "Just in case that is a mantling material, this is a goodplace to have a good look at rocks." Meanwhile,the Spirit Mars rover at Gusev Crater is undergoing a winter check-up. All ofthe robot's cameras are being evaluated. So far, everything appears well withthe Mars machinery as it performs a winter science campaign of observations onthe red planet. On August 8,Spirit saw the shortest day, the winter solstice in Mars' southernhemisphere. Spirithas finished acquiring images for the "McMurdo panorama" a full-color,360-degree view of the rover's winter haven within the Columbia Hills in GusevCrater. Thatset of frame-by-frame images from the robot's panoramic camera--as with all scientific data taken during this time period--has required extra time to complete. That's due to the Sun now lower on the horizon, resulting in reducedsolar power levels available to Spirit.